A curious quirk of contemporary discourse is the resolute refusal to reason about ourselves in the same way we reason about other animals, despite the fact that humans are – for all practical purposes – highly advanced animals. Bird flocking appears to require an extreme level of coordination, but in practice it is simply an outcome of individual birds following a few very simple rules for motion. Schooling fish move in a similar way. This is considered an emergent behavior – an accidental collective behavior that is not conscious or deliberate on behalf of individuals. Foraging ants tend to go off in completely random directions, but leave invisible chemical trails (pheromones) that are further reinforced when food is detected/transported. This can be thought of as swarm intelligence – creatures without much individual intelligence solving complex problems by each solving a tiny part of that problem, using some form of communication and social organization to ensure a reasonable division of labor. You’ll never hear humans described in terms of emergent behavior or swarm intelligence (well, almost never), despite the fact that all of our individual brains could be described as exactly this type of system: 100 billion neurons each without any real smarts of its own, all firing according to simple rules to create the impression of “intelligence”. It is as if the idea of a swarm is somehow beneath us as a species, or perhaps an honest and in-depth study would reveal some unpleasant truths about the so-called “wisdom of crowds”. My guess as to why this topic doesn’t come up much in human biology: the results would be hard to understand. Flocking and foraging are complex behaviors for birds and ants, but still appear simplistic to our massively-evolved human brains. However, a human swarm intelligence necessarily implies something much more intelligent than any individual human, and we can’t understand higher intelligence. Emergent behaviors among groups of humans surely exist, and yet we struggle to see the pattern. We only seem to become aware of their existence through the proxy of easy-to-measure collective outcomes: income, crime, voting, health. As per today’s fashion, we paper over these inexplicable collective differences as being rooted entirely in geography or family history. Some of that is probably true; we adapt to our environment, and epigenetics can transfer some adaptations to descendants. Clearly the equation is more complex, given that these conditions persist after decades of deliberate screwing with the geographical and socioeconomic equation. It’s also become fashionable to describe ideologies (including religion) as a kind of “mind virus” that infects individuals and spreads to entire groups and societies, more popularly described by the term memetics. However, given what we know of swarm intelligence and emergent behavior, we should consider the alternative: perhaps these fashionable thinkers are reversing cause and effect. Perhaps ideas, memes, and culture are not independent entities, even in the abstract. Perhaps these constructs are simply the outcome of certain groups under certain conditions. Perhaps these transcendent properties are simply the emergent behavior of groups. Perhaps memes do not transmit culture, but are simply an expression of culture. Perhaps the Great Meme War is just real-life emergent gameplay. I’m not going to set out to prove my hypothesis. I don’t have a massive research team or several years to conduct experiments. Should you choose to consider it, however, the hypothesis has a lot of explanatory power. It enables us to make useful distinctions between individual behavior and group behavior. There may even be some mathematical law that predicts a likelihood of certain behaviors emerging based on the number of members of a particular group, with additional second-order effects from extremely large groups. There could be consequences for social groups and working groups, in terms of both their total size and their distribution. It might demonstrate some unintended negative consequences for dense urban development, immigration, diversity programs, and even social media organization. Hm… probably best not to investigate, then. We can’t afford to have unpleasant facts disturbing the order imposed by our new state religion. Equality vs. Equity: Who Cares? I’ve been hearing this comparison from mainstream conservatives and classical liberals who are trying to come to grips with the radical egalitarianism of the neo-Marxist left. Often it involves a cringe-worthy meme, which I will not post on principle, but suffice it to say, it involves crates and third-world children. What you’re advocating for isn’t actually equality, which is liberal; it’s equity, which is Marxist. What we’re advocating for isn’t actually equality, which is liberal; it’s equity, which is Progressive. Notice the problem here? So-called moderates have accepted the framing of postmodernists, which is that of course equality is a beautiful and sacred value to hold above all others, but it’s just so hard to achieve, and really the best we can do is aggressively root out and prosecute those thought-criminals known as racists and sexists, but maybe it’s not good for society if you call everyone a racist, and please don’t call us racist, we can find some kind of compromise. When liberals and conservatives accept this framing, neo-Marxists always win. It’s no different from the arguments I used to have 10 years ago, where I naively and smugly pronounced that equality of opportunity is not the same as equality of outcome. I thought I’d made some powerful and provocative point, but actually persuaded no one. As I quietly drifted out of politics to concentrate on my career, I came back years later to find progressives arguing over whether equality of opportunity is merely insufficient or if it is a totally incoherent idea. And while sane liberals such as Sargon of Akkad, whom I truly consider to be a modern-day cultural hero, try to present the same arguments I presented a decade ago, I’m forced to conclude that Dylan at Vox is actually correct – or at least, his argument is more persuasive. Equality before the law is not equal opportunity. Even if we deny everything we know about genetics, different individuals still come from different families, cultures, and socioeconomic backgrounds. They really don’t have equal opportunity, and since liberals are predisposed to ignore intergenerational effects (e.g. the economic incentive to work hard and save money so your kids can have more opportunities than you did), they are easily manipulated into supporting more authoritarian equity programs. If you’re reading this, and you’re a trad-liberal, and are wondering how to inoculate yourself against the virulent progressive strain of equalism… sorry, I can’t help you. But to anyone who considers themselves right of center, it’s very important that you learn to reject the Marxist framing and apply your own. Historically-marginalized groups can never achieve the same outcomes as historically-privileged groups by simply receiving equal treatment, because they start from a major disadvantage. Therefore we must do everything we can to elevate such people until all disparities disappear. It isn’t possible to eliminate all disparities, and trying to do so makes things worse because it creates perverse incentives. Unequal outcomes are the result of free choice, and individual liberties and free markets produce the highest rate of good outcomes. Inequality on a massive scale is absolutely necessary for civilization to function at all. Almost all major advances by humanity are because of a tiny number – less than a thousandth of a percent – of people who ever lived. They succeed in free societies because they are talented, not privileged. It is completely unacceptable to risk destroying their life’s work in the name of “equality”. If not for equalists, we might already have cured cancer and started colonizing other galaxies. I’m sure there are better rhetoricians out there than I am, who can come up with sharper language than I have. The takeaway here is that human ability, regardless of how you measure it, has a Pareto distribution, and that any equality/equity policies designed to collapse that distribution will necessarily collapse all human development. In a group of 10,000 people, if you lose the top 1% of performers, you lose 50% of your total output. You do not want that to happen. Not even once. Equality is therefore anti-progress, and anti-civilization. There is absolutely no reason to get caught up in a debate over equality vs. equity, or equal opportunity vs. equal outcome, because all of the above are incoherent and destructive. So start owning it, rightists. Equality is the fever dream of an emotional child, not a useful model for social organization or governance. You won’t persuade postmodernists because they never actually cared about equality in the first place (only power politics), but they tend to back away slowly after realizing there’s no emotional lever to manipulate, and you might be able to snap a few low-level conservatives out of their hypnotic trance. To the untrained eye, there appears lately to be a lot of divisions within the political right wing. As New York progressives stare slack-jawed and Clintonites build laughably simplistic models, it’s become apparent to me that the divisions are not factional, but evolutionary. Like a classic role-playing game, each ideological “tier” represents a level-up that unlocks new abilities: new ways to think and reason about today’s economic and social ills, new defenses against the ideological indoctrination of the left and new techniques for going on the rhetorical offensive. This isn’t a hierarchy. It’s not a way of saying that every Lv5 is a better person than any Lv2. It’s not a measure of overall intelligence, or authoritarianism, or even the precise location on the political compass. If anything, level-advancement brings heightened awareness of the irrelevancy of the left-right axis, at least anywhere to the right of classical liberalism. It’s a personal evolution, with each individual having their own unique set of attributes, ideas and tactics. In other words, if you see yourself on Lv1 or Lv2, that’s not intended as a strike against your self-worth; only a sign that your political philosophy has some room to grow. Also: You do not level up by simply knowing about the different levels. You have to feel it on an instinctual level and be able to articulate it clearly, and that means fighting some (verbal) battles against average and midwit SJWs and neoliberals, not just the dumb shitlibs you see ranting on social media and in spin class. Trash mobs don’t give good experience or loot. Vague sense of unease that our freedoms are slipping away. Desire to preserve some or most aspects of our current culture and lifestyle. Faith in the integrity and self-correcting nature of our public institutions. Comprehension of how incentives drive behavior. Desire to maximize human flourishing. Disgust of Marxism, dislike of socialism and big-government programs. Faith in the self-correcting nature of competition and constitutional democracy. Understanding of opportunity cost, time preference, and economic calculation. Desire to maximize individual liberty. Distrust of all coercive monopolism, including cronyism/regulatory capture. Faith in the self-correcting nature of Sovereign Individuals. Backward-looking, short-term. Rejection of “living constitution”, expansionism. Recognition that the State is not and will never be a benevolent force. Desire to minimize conflict through private property and/or shared values. Invalidation of all State property, or 100% allocation to defense, law and order. Awareness that nothing is self-correcting and physical removal may be required. Backward-looking, medium-term. Rejection of egalitarianism, mass migration. Recognition that politics is downstream from culture; democracy as a means of conflict-resolution is a beautiful lie. Desire to completely eliminate left-wing institutions, values, and entryism. Repudiation of compromise between right and left (the center cannot hold). Realization that western traditions protected us, and we have still not matured. Backward-looking, long-term. Rejection of federalism, imperialism, etc. Knowledge of how heritable traits influence intelligence, behavior, and culture. Desire to preserve western civilization above all other concerns. Willingness to use any tactic or tool of the left (including the State) against it. Acceptance that western tradition can only survive with western demographics. Note how I don’t make explicit mention of any level’s ideal vision of society. This is about degrees of awareness, and persuasion techniques that one is able and willing to use. You can be a race realist, and still wish for a NAP-based solution. You can be anti-egalitarian and still hope that, some day, as Iain M. Banks imagined, people might legitimately be able to change their fundamental nature with technology. You can hyper-optimistically predict, as I do, that if we can make our species more intelligent, we’ll be able to come up with even better solutions that none of us can conceive of today. That said, if you like western society exactly the way it is today and don’t want to see anything rolled back, then you’re either a neoliberal/progressive or not very good at this game. You might want to try an easier game, like pattycake or moving to Canada. How to Manage Any Problem–in 5 Easy Steps! So, you’ve just been appointed manager of a high-performing tech team. Congratulations! You are on the fast track to career success. One of the most important skills you’ll learn as a manager is what to do when your team discovers a major issue that threatens to miss deadlines, lose customers, or Leave Money on the Table. You may be tempted into thinking, “wow, we are in a real pickle now, but I don’t understand the system or have any special skills, so I’d better hope my team can come up with a solution!” Of course, you and I both know better than that. It is completely WRONG for reasons that probably exist! Fortunately, this is actually a very easy situation to deal with, using a scientifically proven 5-step process that is 100% guaranteed. It is actually an iterative process based loosely on the “OODA loop” popular in military strategy, which stands for: Obscure, Oversimplify, Distract, Aggravate. Here is the patented process adapted for business managers. Let’s be honest, you spend 7.2 hours a day in meetings, and must use those precious breaks in between meetings to refill your coffee mug and not listen to Status Updates that you request. You don’t have time to actually read your email. All but the most incompetent managers can perform this step naturally and without effort. But wait. You aren’t just any manager. You are a high-powered, high-efficiency, Hands-On Manager. You want to Demonstrate Value. It is not enough to simply passively ignore your email. You might see a stray subject line and become curious enough to click on it. So it is very important that you actively, militantly ignore any and all emails relating to the problem, to avoid accidentally becoming informed of any of the technical details. While you are doing this, your team has likely already found the root cause, identified possible solutions, and estimated how long they will take to implement. Do not allow this to divert you from your primary goal of remaining completely and totally oblivious to the problem. Sometimes you will be lucky enough to have a real, actual Customer Complaint from a real customer who, despite your crack Customer Care team’s best efforts, somehow navigated successfully through the Choose-Your-Own-Adventure Voice Navigation telephone game and was able to speak to your one on-duty Human Representative. But this is not very likely. A much more reliable source of complaints is Higher-Ups, such as your Boss and your Boss’s Boss and so on, all the way up to the CEO. If all of these people hate your product, which is often the case, you can entice them into trying it out again with the prospect of an Exciting New Feature. Yes, you’ll say, I know you hated it before, but we added a new feature! You must try it! Keep at it and eventually they will complain to you about the broken thing that your team has now been working on for 7 weeks. Both your Higher-Ups and your Minions understand intuitively that Meetings Solve Every Problem. Need to track progress? Have a Status Meeting. Need to communicate with the person who sits 2 feet away? Hold a Sync Meeting. Need to remind everyone that you are an Effective Can-Do Manager? Have a Review Meeting. Meetings are the ketchup of office work. There is nothing that they don’t make better, not even double chocolate donuts. After several weeks of working on this exact problem, some of your subordinates may have gotten the crazy idea into their heads that they might be able to solve the problem on their own. Ha HA! Those jokers. What you need is a Discussion, so send out that invitation. For optimal results, send it out on the same day as the meeting itself, preferably no more than 2 hours in advance, and mark it as “important”. Start the meeting by reviewing the short and incomprehensible report provided by the Customer, Higher-Ups, or other External Complaint. Ask your most senior members for an Explanation of the issue. At this point, some managers like to reject the Explanation and provide their own Alternate Explanation based on Clogged Pipes, Cosmic Rays, or Demonic Possession. You can adjust this to your preferences. Your version will be proven wrong, but the objective here is not to demonstrate knowledge, only to extend the duration of the meeting. Be creative with your criticism. Make sure to say prioritize and urgency a lot. Also try using synonyms like Triage and Stack Rank. If the meeting is progressing too quickly, ask the team to “deprioritize” some tasks that all of the other tasks obviously depend on, then watch as hilarity ensues. But most importantly, you’ll want to express deep concern that the solution could Take Too Long. Continue hammering the point, until the meeting is over, that there must surely be a Faster Way or an Easier Way and that if only Someone Other Than You could be a little more creative or clever, it could be done in 1/10th of the estimated time. You may have time to do this in-between meetings. However, in this one and only instance, you may have to cancel an existing meeting in order to perform this task. Your mission is to Help the various people on your team until they give you a clear sign that they Understand and Appreciate Your Help, such as by saying “thank you” or killing themselves by jumping out a window or, for first-floor offices, drowning themselves in a restroom stall. Eventually, after a few days of hovering, your team will start to become unproductive and stressed. Your work is now done, and you can resume your normal regimen of meetings or better yet, take a vacation. You have successfully Demonstrated Value in a time of Crisis while under Extreme Pressure. Top executives will have noted your Proactive Approach and Leading By Example. Keep it up, and you might soon be Director or even Vice President! I hope this guide helps jumpstart your career in management. Good luck, and remember: Your team needs you! I’m always amused when I see someone pronounce on social media that they’ve “solved” the problem of artificial superintelligence, or insist that they have a 100% ACCURATE! prediction of where it will lead, often used as flimsy pretext to justify some awful idea like Universal Basic Income. This, despite the fact that some of the brightest minds alive today have been working on the Friendly AI problem for over a decade and still aren’t even confident in their predictions, let alone their solutions. Too much has already been written on why we should or shouldn’t be worried about ASI. If you’re unfamiliar with the debate, there’s a good summary and great infographic at Future of Life. I won’t rehash that here. Instead, I want to explain why there are so many terrible ideas and predictions floating around the “I F***ING LOVE SCIENCE!” crowd (i.e. not scientists and certainly not AI researchers). And indeed, how this very same problem applies to human intelligence and infects every aspect of social and political thinking. Dunning-Kruger explains why, as a middling chess player, I can predict who will win in a game between amateurs, but have no clue what’s going to happen next in a grandmaster game. It also explains why many new business owners have very high turnover; they’re still learning the trade and can’t tell good from bad, and have to use a trial-and-error approach to hiring. Rating systems address this; in chess, it’s completely objective, and on Yelp it’s very subjective but still a decent predictor of outcome. With intelligence, the objective rating is IQ. Despite appearances, I’m not an IQ-ist. I have never asked anyone for their IQ, nor told anyone mine without having explicitly been asked. You don’t need to be smart to be successful, or even to master a particular trade. IQ is not a reliable individual predictor of life outcomes. At an aggregate level, however, it informs us of certain social outcomes. A phenomenon called assortative mating explains why successful relationships tend to involve partners of similar IQ, which itself explains why marriage is for the rich. It also explains why high-IQ nations have more economic output than low-IQ nations. A lot of people know this, but what they do not realize is that the relationship between average IQ and collective outcome is not linear, it’s exponential. The exponential relationship is important. We measure IQ on a bell curve, but the measurement itself is more like a decibel of sound than, say, a degree on a thermometer. Various high-IQ societies have each done their own analyses, concluding that an approximate 5-point increase is equivalent to double the actual intellectual performance (i.e. problem-solving speed). So, on average, a 150-IQ individual can solve problems about 60 times faster than a 120-IQ individual, and more than 1000 times faster than a typical 100-IQ individual. Those numbers are insane to think about. Try to imagine driving your car, on the same roads you’ve always driven on, but at 3000 mph. Or 50,000 mph. It’s all just a blur at that point, and the 3000 mph blur doesn’t feel much different from the 50,000 mph blur; either way you’d probably crash instantly. An X-15 pilot could relate to 3000 mph in the wide-open skies, but navigating ground traffic over short distances at that speed would still be inconceivable. Your commute time would be way shorter than everyone else’s. Being stuck behind a 1 mph vehicle would drive you crazy. Anyone else going much faster than 1 mph would stand out. A lot. You still wouldn’t be able to see a car going by at 3000 mph. It’s not too difficult to imagine other people being slower than you – either physically or intellectually. You won’t really understand or empathize with their experience, but you can interact with them, and you can predict their behavior. However, none of us – not even the smartest of us – are capable of even imagining higher intelligence than our own, because if we could, then we’d be more intelligent ourselves. We can imagine the outcomes of being super-smart, like having a dozen Ph.Ds and starting 50 wildly successful companies, but not the actual process of getting from here to there. Ability can be intelligence, or anything you can observe or measure. These distributions pop up everywhere, by the way, as the fabled “80/20 rule”, although in reality it’s often more like 90/10, or even 99/1. It all depends on how far right the x-axis goes. 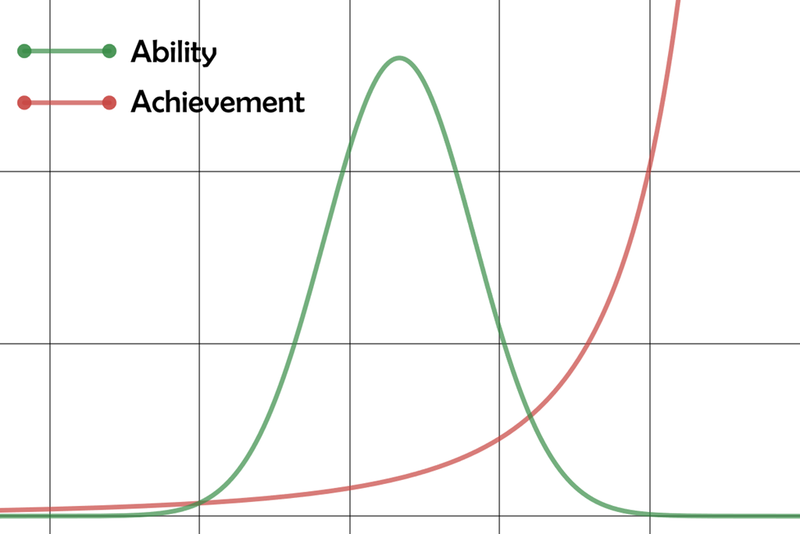 In the above example, more than 4-5 standard deviations above average ability is literally off the chart for achievement. Not every field of human endeavor will have this exact scale, but almost all have this general shape. If you equate “achievement” to “wealth”, and you imagine (incorrectly) that the amount of wealth in the world is fixed, then this graph looks terrifying. However, if achievement represents the production of wealth (or other resources), all of history starts to make sense. The poorest family in America today lives better than the richest kings and aristocrats of Europe in the middle ages, and it’s all because of the achievements of a very small number of inventors, entrepreneurs, artists, military generals, and so on. As historical figures, we hold prodigies like Rembrandt and Edison in high respect, even reverence. They advanced civilization by leaps and bounds. Yet today, the trend seems to be fear and jealousy, as though these “1 percenters” are vampires feeding off us plebs. The reality is, if I, not Steve Jobs, had been the CEO of Apple, you wouldn’t have your iPhone, and Apple probably wouldn’t exist anymore. If you, not Lincoln, had been president during the Civil War, America wouldn’t be a single country. These outcomes required unique individuals. Maybe the resentment was always there, and just omitted in the history books. Either way, the more heterogeneous a group, the more resentment you seem to get. Every identifiable subgroup seems to be equally hypocritical, believing that the lower-achieving subgroups simply don’t have the same ambition or ability (which is mostly true), but at the same time deluding themselves into believing that higher-achieving groups got there by cheating. This is essentially the basis for all collectivism and identitarian beliefs, which are best described as weaponized intellectual laziness rather than coherent ideologies. An artificial superintelligence would be way past the edge of today’s Pareto distribution. The ASIs would become responsible for nearly all “human” achievement, unless we could keep up via genetic enhancement and technological augmentation. If we lag behind, then we would all become insignificant underachievers compared to the intellectual and creative marvels produced by the supers. What I wonder is: are we ready? Assuming, hypothetically, that ASI is Friendly, are we emotionally and intellectually mature enough to deal with a social class over and above the current billionaires? Machines that we can’t even begin to understand, but are nevertheless responsible for managing vast amounts of resources and producing almost all of the new goods and employment opportunities? I’m not really worried about superintelligence destroying jobs or culture, because that’s not what actually happens when you add super-producers to a society. What I wonder about is whether we would be able to accept the new reality, or whether humans would collectively become so bitter that they’d immediately try to destroy it. Futurists believe that ASI will save us and deliver a post-scarcity economy. I’m not sure if we could handle it. My hunch is, the only way we’ll be able to truly advance beyond General AI is by improving ourselves, not our machines. In a previous post, I talked about the importance of general intelligence in social, economic, and geopolitical outcomes. Physical health can be improved with medicine, and mental health can be improved with techniques like Cognitive-Behavioral Therapy, but the true nature of g remains elusive. What we do know is that adult intelligence is 80% genetic, making the task of improving average intelligence daunting, but not impossible. Some public figures don’t think we’ll ever be able to push IQ numbers up around the world, but the Flynn Effect suggests otherwise. Here’s how not to go about raising intelligence: take the brightest boys and stuff them into suffocating, stultifying, soul-sucking feminized classrooms where all their innate curiosity and creativity is replaced by rote memorization, amphetamine-induced trances, and a hefty dose of propaganda. If throwing more money at public schools was going to solve the problem, it would have already been solved by now. The best environment for children to learn seems to be in their own homes, with a consistent caregiver and plenty of opportunities for unstructured play. The War on Poverty, War on Drugs, and War on Terror are all miserable failures, so there’s no reason we should expect a different outcome from a War on Stupid. Public schooling was always intended to be civic education, and has generally failed at that, but just because we’ve been relying on one wildly inappropriate educational tool for centuries does not necessarily mean that there aren’t other, better solutions. In fact, we’ve learned a whole lot about intelligence and there are some very promising avenues of scientific inquiry and technological development on the horizon, any one of which could launch us at least partly over the Phase 1 hurdle. Caveat: we have to accept that in the early stages, intelligence-tech will be limited to the wealthy and powerful. In that respect, it is no different from any other tech, including your iPhone, car, and plumbing. Breakthrough advances require a ridiculous amount of investment capital to push past the plateaus, like the latent heat of boiling water. So this will probably start with the billionaires, who will make it available to millionaires at a generous profit margin, who will come up with lower-cost versions for the middle class (or perhaps offer it as a high-skill employment benefit). Eventually the working class will have access due to falling costs, charitable donations, specialized loans, or some sort of government subsidy. This is assuming it’s actually left to the free market and not stifled by regulation and cronyism. The surest way to lower intelligence is with a Traumatic Brain Injury (TBI) – a blow to the head. Mild concussions generally don’t cause permanent brain damage, but multiple concussions do (as with contact sports), and anything more serious is either fatal or can cause permanent damage. If you play Thief and are a fan of takedowns, then congratulations, you just ruined the lives of several simulated humans whose families would have been better off if you’d just killed them, because brains don’t naturally heal. Our brains are pretty amazing and can adapt to all kinds of damage, including losing half of them, but they don’t grow back. At least, they don’t grow back yet. We now know that neural stem cells can repair the damage. Pro-lifers, don’t worry: these aren’t embryonic. This is not theoretical; there are clinical trials going on. We will soon be able to erase most or all of the injury-related intelligence deficit. CDC reports 2.5 million TBIs a year, and that’s only the people who seek treatment (i.e. not mild concussions). Rough estimate: Assume not all injuries are equally severe, and we reverse a 10-point drop in IQ at a rate of 500,000 injuries per year. Also assume that this is retroactive, and we can capture up to 40 years’ worth of TBI victims who are still alive and still in the USA. That’s a national IQ increase of about 0.65. Not too shabby, and more than half of what’s needed for other western countries to make the jump from 96 to the magical 97. If you are terrified by the prospect of CRISPR, I don’t blame you. We don’t have the best track record when it comes to unintended consequences of genetic engineering. However, there are some genetic diseases that are actually very well-understood, but still not solved, like Down syndrome. We’re not yet at the point where this tech is being used (or even seriously considered) during a pregnancy, but as genetic screening becomes more advanced, demand will go up despite the inevitable controversy. There are hundreds, maybe thousands of genes affecting intelligence, but if we take a “simple” example like Down syndrome, it’s a 50-point drop in IQ for an admittedly tiny fraction – 0.15% – of births. Gene tech probably can’t be used retroactively, but assuming a birth rate of about 4M per year, correcting this defect over a 25-year period would affect 150,000 people, for a net IQ gain of 0.025. That’s not a lot, but remember that it’s just one genetic condition. If we can fix a hundred conditions each with less than 1/5 of the impact of Down, that’s another potential boost of 0.5 to the national IQ, plus a massive humanitarian benefit. Most people associate intelligence with brain size – i.e. number of neurons. A few years ago, researchers did a pretty amazing “quality over quantity” experiment and created chimeric mice with human glial cells and astrocytes. The human cells took over, and the mice performed better and faster at almost everything. These were still mice, with normal-sized mouse brains and mouse neurons, but a few small tweaks to the surrounding cells made all the difference. This was an amazing discovery, like finding out that you could made your car twice as fast by swapping out the fuel injector. The entire human brain is still far too complicated for us to fully understand, but individual cells are well within the sphere of human knowledge – and engineering. And if human cells are better than mouse cells, it’s very likely we can design synthetic cells that are better than human cells. The ethics are dicey, but the testing could still be done on mice (i.e. compare human-chimeric with synthetic-chimeric), and I know some crazy transhumanists who’d eagerly volunteer as human test subjects if the animal tests looked promising enough. We may also be able to use synthetic neurons in the future, although so far, there’s no evidence that they’d be “better” than the ones we already have. Sorry, Data. Limitless was a terrible movie, and the TV show is even worse. There is not and can never be a drug like “NZT”. But one positive outcome of all the fiction has been the exploding field of nootropics (smart drugs). Experiments here are mostly anecdotal and self-reported, which involves some bias and placebo effect, but there are some very interesting results. Nuvigil is a legitimate wakefulness drug with some scary side effects. There’s phenylpiracetam, which seems effective enough to be banned as a performance-enhancer. Modafinil is apparently the gold standard for Silicon Valley assholes entrepreneurs. CILTeP was popularized by Tim Ferriss. Most of the reports describe similar effects of feeling clearer, sharper, more focused, and generally being able to get a lot done. Disclaimer: I have never taken, nor do I endorse, any of these drugs. A lot of it is probably snake oil. But some of it is not; for example, phenylpiracetam is a legitimate prescription drug in some regions for treating cognitive decline (e.g. dementia and other non-TBI conditions), and there is promising research with LSD microdosing. I don’t think there’s any magical pill to boost real IQ permanently, or even temporarily, but if the research continues, there may be useful options that allow people to operate at a higher effective IQ, sort of like overclocking your CPU. Because of all the uncertainty, let’s peg this at a potential +0.2 average IQ effect. The lowest on this list, but still merits a mention. Ray Kurzweil predicted that human brains will eventually extend to the cloud. His rationale is that they already basically do, just with a clunky interface: when was the last time you forgot your smartphone, and how did it feel? So far, real-world brain-computer interfaces (or “BCI”) have built up some impressive yet still boring accomplishments like typing very fast. But the late Iain M. Banks wrote in his sci-fi about a “neural lace” that linked human brains directly to technology, and prototypes are already being tested on animals. And when it’s got Elon Musk’s name on it, you know that the ultra-rich are going to be firing billions of dollars out of their cash cannons at the problem. If you don’t believe that a closer link to technology raises capacity for amazing intellectual feats, you aren’t caught up with your /pol/. Processing massive amounts of text, images, audio and video is basically all the human brain does. But our internal storage space is low-fi and extremely limited, estimated at about 2.5 PB, which sounds like a lot if you don’t know that tech companies are already storing exabytes (2.5 EB = 1000x the maximum brain capacity). Give people the ability to interact almost instantly with data in the cloud – or even transmit it to each other in real time – and a reasonable estimate would be a 5-10 point effective IQ boost in the next 15 years. This does depend on technology outside the brain, but what part of our modern lives doesn’t? Imagine being able to “record” everything you hear or see onto long-term storage without having to resort to endless repetition or clunky mnemonics. That technology is on the way. At first it will likely be directed at people with specific disabilities, but much like smart drugs, tech like this will eventually be used for intellectual performance enhancement. Memory function is one of the best-understood aspects of cognition right now, so memory implants will come first. Eventually we’ll start to see more inventions around executive function and emotional control as TMS experiments yield more discoveries. I think of neuroprosthetics as the “offline” version of BCI. They have to fit in your head, which diminishes the possibilities, but on the plus side, they don’t rely on possibly unreliable networks and creepy gatekeepers. Neuroprosthetics are the most immature and least understood today, but I predict they’ll become the most attractive option in the more distant future (30-40 years from now, if engineering progress maintains its pace). While researching this, I stumbled upon an analysis from the Healthy Home Economist suggesting that the ideal interval between births at least 3 years apart, which is significantly longer than the apparently common wisdom of 2 years. Lack of proper nutrition can really hinder intellectual (not to mention physical) development. Nutrition isn’t a panacea for intelligence; we can’t simply dump free food onto every malnourished child and family, because that changes the incentives to favor dysgenics (more kids, lower parental investment). However, spacing out the births just a little bit more is a double win: it slightly lowers the birth rate for the lowest-IQ populations (who statistically have the most children), and also supports more intelligent kids with generally better life outcomes. I am of course not suggesting this as a totalitarian policy like China’s “one child”. We should simply be making every effort to get the word out, and possibly modify any existing pro-birth government incentives to favor the larger interval. There isn’t any easy answer to human intelligence, and many will argue persuasively that there are cultural issues driving the downward trend. They are probably correct, but unfortunately, what’s done is done, and changing culture is difficult and slow. Technological innovation, however, is happening at a very rapid clip. Intelligence tech is where our intellectual future lies, and where we need to invest if we want to avert long-term societal breakdown.